Every now and then I like to go back and re-read the classics in out-of-body experience (OBE) literature. This is one. 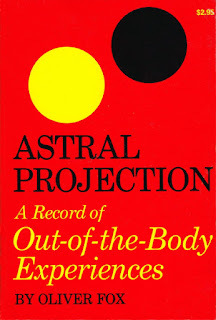 This is probably the second or third book I ever read on Astral Projection, so I didn't remember anything about it. It's unclear to me exactly when the book was written. The earliest copyright date in my copy is 1962, but Fox's earliest written articles about his OBEs appeared in Occult Review in 1920 and his OBEs were from around 1902, which predates even Sylvan Muldoon's OBEs. Some might argue Muldoon was the first, but while Muldoon's book may have preceded Fox's, I think Fox's articles in Occult Review preceded Muldoon's classic 1929 book The Projection of the Astral Body. Although most of the book is centered on Fox's OBE narratives, he does give several pieces of advice for inducing OBEs (although not as much as some books, for example Jonas Ridgeway's Exploring Your Inner Reality which I previously reviewed.) The book is very similar to Robert Monroe's first book, Journeys Out of the Body in that respect. The third method is the "Instantaneous Method" which is more like traditional methods of inducing OBEs: The use of active imagination to trick your awareness away from the body. This would include Robert Bruce's "Rope" technique, William Buhlman's techniques, and many others, mine included. But then he discovered a terrifying consequence: He couldn't reanimate his body again! Well, at least not for some time. Eventually it was like Sleep Paralysis sufferers: the body eventually woke up and pulled him back in. Another noteworthy thing is that Fox talks about "skrying" but he has his own interpretation of what that means. To most occultists, skrying means something akin to crystal ball gazing (for example, see Donald Tyson's book Scrying for Beginners). To Oliver Fox, it meant shooting into space like a rocket, in an out-of-body state. Another interesting topic is that of projecting while in bed with someone. I've always found it extremely difficult (but not impossible) to induce the OBE state from my bed if my wife is sleeping beside me. William Buhlman has told me the same thing. But Fox didn't seem to have any problem with it at all. The writing is very eloquent and flowery; the polished work of a seasoned writer. In fact, Fox tried to make a living as a writer, but was never very successful. The book is 160 pages, but with large margins. So there's a decent amount of content. It's not as good or as long as the books in my top ten list. But it's a classic, and an important look into OBE history; a "must have" for all serious OBE book collectors like me. 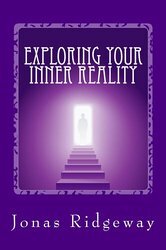 Today I'm reviewing the book Exploring Your Inner Reality by Jonas Ridgeway. Although it isn't on the front cover, the back cover clearly says A Guidebook For Out-of-Body Travel. I enjoyed this book very much. It's 167 pages, but its small margins and decent font gives it a lot of content. I apologize in advance if this article runs long, but I put tabs on lots of pages, so there's a lot to talk about. Another interesting and insightful thing is this: Ridgeway normally deliberately flies backwards as a tool to keep his conscious mind from getting distracted and/or interfering with his goals. He's right that you need to be warm and comfortable, but to me, warm and toasty is about 73F. If the room is 68F, I'm uncomfortably cold. Chapter 5 talks about vegetarianism and veganism. Like author Graham Nicholls and others, Ridgeway says that it helps to not eat meat. (I've always been on the other side of the fence, along with author William Buhlman). This is a very powerful piece of advice. The book also talks about the author's attempts at validation. He did some experiments that reminded me of author Frederick Aardema's. He created a deck of 25 pages of notebook paper labeled "1" through "25". Every night for a week, he shuffled them, then put them in a pile with one face up, under his bed. After leaving the body, he crawled down there and tried to see the number. Unfortunately, his attempts at validation failed every time. He had some pretty insightful discussion about why his attempts failed (although I thought Aardema's discussion about this topic was more fascinating). He noted, for example, that the room appeared quite foggy, which makes me wonder if the problem was due to being too close to his physical body (i.e. inside "cord activity range"). This interference caused by expectations is one of the main reasons he likes to fly backwards. Despite his failed attempts at validation, he shares a few awesome validation stories. In one, he traveled in an OBE to his parent's home, and into his brother's bedroom. He saw a piece of paper atop his dresser with a phone number and a girl's name: "Catherine". He didn't try to memorize the phone number, but later, when he checked with his brother, he confirmed that there was indeed a piece of paper on top the dresser with a phone number and a girl's name. Oddly, the name on the physical piece of paper was "Cathy" not "Catherine," which brings up more interesting discussion. Ridgeway's mother also had occasional OBEs. The first one was so realistic that she insisted doctors perform a brain scan (which showed nothing unusual). Another piece of validation came from one of his mother's OBEs. She projected from Oregon to Arizona to visit her daughter, Ridgeway's sister. She found her daughter, but was surprised to see that she was now shockingly overweight. A few weeks later, when she visited the daughter in Arizona, she discovered the daughter was pregnant; a fact that she had kept concealed. Another fascinating report by the Ridgeway is something he calls "The Astral Jukebox." Basically, he discovered that in an OBE, he could listen to any song he wanted, with absolutely perfect reproduction. Eventually, he discovered that he could also play songs (in their entirety) that hadn't been recorded physically. This brings up some interesting discussion: If you hear a Janis Joplin song that was never recorded, is it (a) manufactured by your own subconscious mind? (b) recorded on the astral plane by Joplin herself, (c) a song she recorded once that was lost? or (d) something else? It's all very fascinating. It's definitely added plenty to my astral "to do list." The grammar, punctuation and spelling were nearly perfect. This book is very fascinating, insightful, and very helpful for people who want to have OBEs. I found very little with which I disagreed. This is one of the better OBE books out there. It doesn't have many narratives, but every page has lots of good information. I give it a big thumbs up.